Leonard has played volleyball since she was just a bit bigger than one. She grew up in Hilo, HI, where volleyball is one of the most popular sports for both men and women. She started playing as soon as she could walk and joined her first competitive team at the age of 5. In Hawaii, volleyball serves as an important community builder, and almost everyone around Leonard was involved in the sport. Her father was a coach, all her cousins played — two going on to play in college — and she and her six best friends were teammates from elementary through high school. With the help of her father’s coaching, playing every day in her backyard, Leonard quickly excelled at the sport. What she lacked in height and speed, she made up for with advanced ball control and a high volleyball IQ — skills developed with her extensive practice. She entered the “Olympic pipeline” in seventh grade and began to spend her summers in training camps under the U.S. volleyball system, continuing to make the junior national team several years in a row. It was then that she said she began to realize her talent for the sport could have real significance for her future. Her recruitment process was complicated and slightly unusual. She never had an official visit to campus, and in fact, her first day on the east coast was the first day of the preseason. It was a stressful transition to say the least, but Leonard said she has made it her mission to repay the athletic department and the Dartmouth community for its unwavering support. To begin with, she was a standout player on the volleyball team, even while struggling through injuries, including a hip surgery her sophomore year. Her last season for the Big Green, her best to date, is a testament to her resilience. She earned a personal record of 320 digs and second team All-Ivy honors. And that’s not to mention her tremendous role as a leader and representative of the team. “Personally, I think Zoe has shown to us that she was not just passionate about the Dartmouth community, about this team, about the athletic department; she also was a great teammate and ambassador to this program,” said head coach Gilad Doron. As Bella Hedley ’22 said, Leonard played a huge role in making younger players feel welcome and included in the team, as well as conveying a genuine passion for the sport. The women’s volleyball team has a lot of young talent, and will only graduate one senior, Leonard, from its starting lineup. Its future looks bright, and Doron gives some of the credit to Leonard, who made it a priority to interact with visiting recruits and prospects. 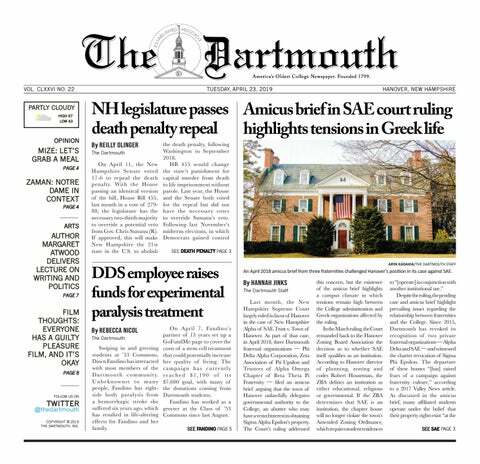 But her devotion to Dartmouth athletics extends far beyond her own team and continues even now that the volleyball season has ended. Leonard does alumni outreach as the student intern for the athletics fundraising office and works game-day operations for men’s and women’s sports as an intern for athletics marketing. Her work at the games entails anything from being on aux at men’s hockey games to in-game promotions at men’s basketball. In addition to all of this, she’s been the Jaeger Civic Intern for the past three years, meaning she helps connect athletes to community service and volunteer opportunities within the athletic department. That’s not to say this fall was the end of volleyball for Leonard. She continues to practice with the men’s club team three times a week and plays in an adult league in Lebanon. After graduation, she hopes to play in the United Kingdom while getting a master’s degree. If her injuries allow, her goal is to play professionally for a few years before entering the workforce. “If I still have miles in the tank, why not keep riding it out?” Leonard said. She has certainly covered a lot of ground while at Dartmouth. Outside of all her commitments to the athletic department, Leonard has also been an executive member of Hokupa’a for two years, the Hawaii club on campus. “It’s a really important community space that I think was really needed at Dartmouth, especially with the growing Polynesian and Hawaiian community,” Leonard said. Evidently, Leonard made enormous contributions to many communities during her time at Dartmouth, and will leave behind, on the volleyball team and elsewhere, a legacy of dedication and involvement. When asked to share a favorite memory from her four years, Leonard spoke about her first ever Ivy League game, when she played in the starting lineup away at Harvard University. To this day she still remembers the game in detail, and particularly, Dartmouth’s 15 to 13 victory in the fifth set. This past fall, women’s volleyball’s conference opener was again against Harvard, though this time it was at home. Again, the Big Green won — again, in the fifth set.